So to continue with the farm share I received last week (Thank you, Cara!! 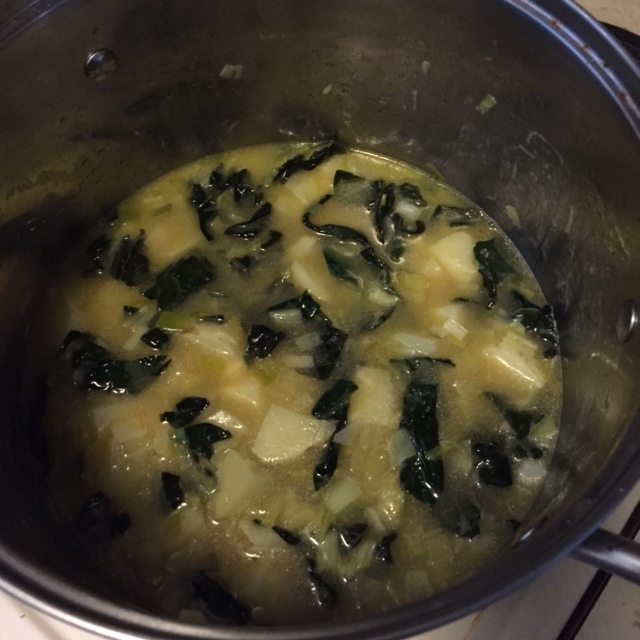 ), I opted to make soup yesterday. It was the perfect day for catching up on DVR and letting something simmer on the stove. 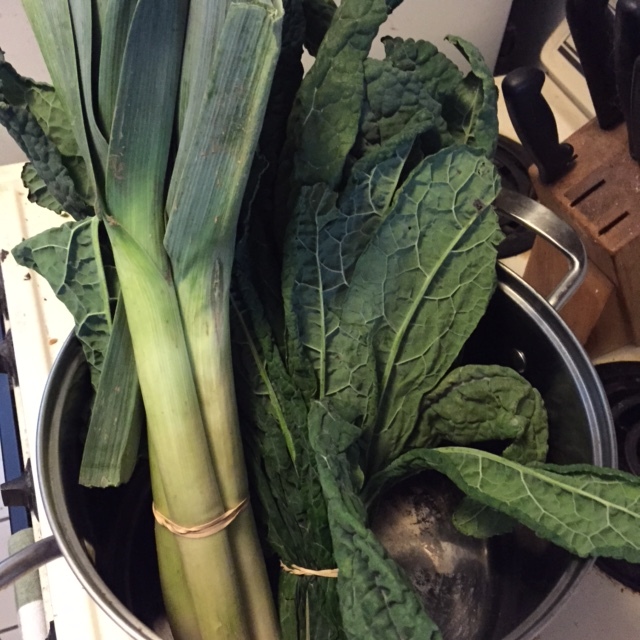 Still remaining from the farm share was kale, leeks and potatoes. You've probably had leek-potato soup before (delicious), and this recipe just bumps up the nutrition factor a bit more. First, the leeks. If you've never cooked with leeks before have no fear. Start by chopping off the roots at one end and the dark green at the other. The part you want to eat is the white to light green that spans the majority of the stalk. The dark green is too tough, so toss it out. I recommend cutting it in half along the length of the stalk and then into quarter inch pieces. Then place the pieces into a bowl of water and let soak for a minute or two to dislodge any dirt. Not too scary, right? In a large pan melt the butter and add in the leeks, shredded kale and peeled and diced potato. I let this cook on low, adding a drizzle of olive oil whenever it looked like it needed a bit more moisture, for about thirty minutes. I added salt (I had sadly run out of pepper - I don't know how that happened) and a little onion powder and garlic salt (personal preference, just a few shakes). 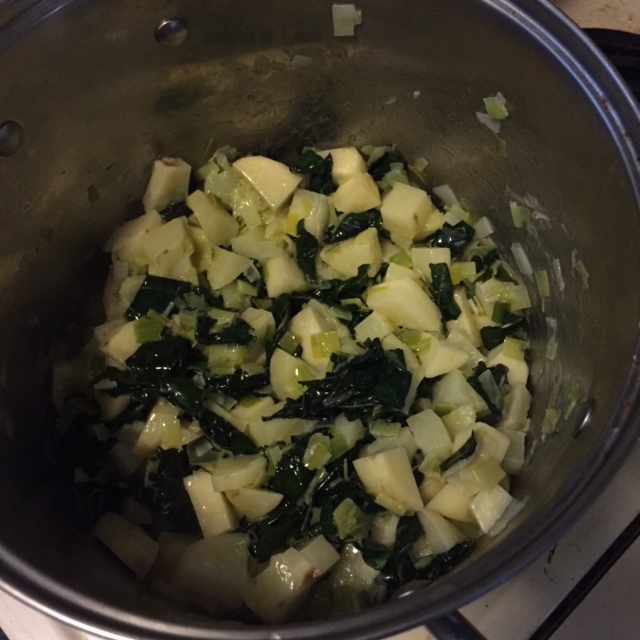 Then I poured in the veggie stock and let simmer for another thirty minutes so the potatoes could soften. After the potatoes were soft enough to pierce easily with a fork, I poured 3/4 of the soup into a blender and pureed it. Then I returned it to the pot to serve. 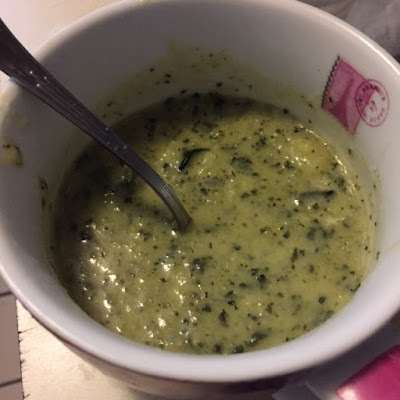 If you want a smoother soup you could certainly blend all of it, but I really wanted a few chunks to remain. Enjoy! And, if you're lucky enough not to be gluten intolerant, enjoy with a chunk of crusty bread! For me. Le sigh.